Photo provided by Gary Arndt. 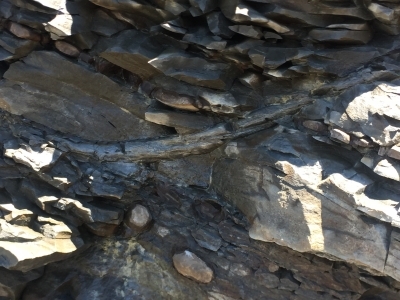 The Joggins Fossil Cliffs is famous for its record of fossils dating to the Pennsylvanian "Coal Age" of earth history, approximately 310 million years ago. The cliffs are continually hewn and freshly exposed by the actions of the tides in the Cumberland Basin. The fame of Joggins dates to the mid-nineteenth century, and the visits in 1842 and 1852 by Sir Charles Lyell, the founder of modern geology and author of Principles of Geology. The fossil record at Joggins also figures in Darwin's "On the Origin of Species", and played a role in the Great Oxford Debate of 1860 between Bishop Wilberforce and Thomas Huxley. Much of the fossil record at Joggins was discovered by Nova Scotian geologist Sir William Dawson (1820-1899), who had a close personal and working relationship with Sir Charles Lyell. Investigations by Dawson led to the discovery of one of the most important fossils in the history of science, Hylonomus lyelli, which remains the earliest known reptile in the history of life. I think that I shall never see a fossil lovely as a tree... 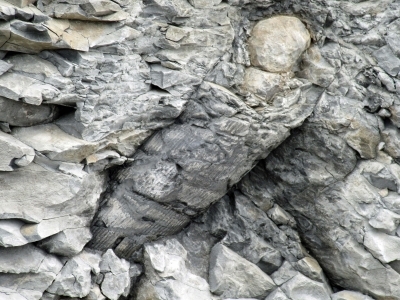 Although Joggins Fossil Cliffs does have some reptilian fossils, the vast majority of the fossils on display are of the arboreal variety. I visited Joggins on a cool September day in 2017 and joined a two hour tour on the beach below the cliffs. The tour guide very helpfully showed how the constant erosion of the cliffs was exposing fossilized tree trunks, and also displayed examples of fossils found exposed on the beach. A museum near the car park on the top of the cliffs provided an exhibit revealing what the prehistoric forests would have looked like for context. I enjoyed the tour, as well as the opportunity to wander around the beach afterwards and look for fossils. That said, I am not as much of a fan of fossil sites as I am of sites with natural beauty, so Joggins Fossil Cliffs resonated with me more for its scenic location along the Bay of Fundy. For those World Heritage Site travelers who love fossils, though, Joggins Fossil Cliffs is one of several Canadian sites that would be well worth a visit. 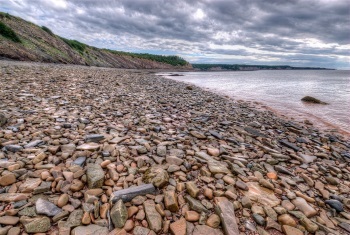 Logistics: Joggins Fossil Cliffs is in a remote location in western Nova Scotia, and requires private transportation for access. The cliffs are near the Nova Scotia border with New Brunswick. Although we were told to book a day or two in advance to get the extensive tour, we were informed it was booked up when we followed that advice. However, when we arrived they allowed us to join the fully engaged two-hour tour. It was a very hot day, and we almost regretted having taken that extensive tour rather than the half hour option which would have been sufficient. The guide was patient and spent most of the time answering questions about whether various rocks were fossils or just rocks It is definitely important to have a guide as many of the fossils, mostly of plants, are not easy to find on one’s own. The seascape of the Bay of Fundy and its cliffs is attractive. Next time I would take the shorter tour because much of the time was taken up with questions from amateur geologists, including ourselves. The Visitor’s Centre was pleasant, and we saw the oldest living fossil reptile called hylonomus lyelli. However, as this was our third fossil site of the trip, we were perhaps not as intrigued as for the first two. Also, fossilized plants and trees are not as interesting as the fish remains and primitive animal forms of Miguasha and Mistaken Point. Joggins Cliffs are located in Northern Nova Scotia, near the border with New Brunswick. The billboards are clearly visible from both directions of the main Trans-Canadian road so it is easy to find the place even without GPS. After my slight disappointment with Miguasha Park, I did not expect too much from another fossil site of Eastern Canada. But in fact, Joggins is much more interesting. Unlike in Miguasha, the most interesting part of this site are cliffs and beach. Although it was extremely windy the day I visited Joggins (so windy that my 2-year-old son could not stand without keeping parent's hand on the beach), the visit was very interesting. You can do it on your own or with a guide and I recommend the second option, as it is easy to miss the most important parts of the cliffs. We started the tour from a place where there was a coal layer among other rocks. Then you move to remains of an ancient tree aged 300 million years! The most funny part is that you can touch it, take photos etc., so it is not comparable with any museum (by the way, the museum in Joggins is also interesting). The beach tour did not take long but was one of the most remarkable experiences during my 14-day trip to Canada. We visited the Joggins Fossil Cliffs in June 2010. We got there while the tide was still high, so we spent some time in the museum, had lunch, and were amazed how quickly the tide went out! Within an hour of our arrival we were able to go down the beach and explore. The cliffs are amazing--layer upon layer of rock and sediment deposited over millions of years. Fossils are easily found on the beach, and new material is brought in by the tide twice a day. Truly amazing. The fossil cliffs were really amazing, especially with the Bay of Fundy (known to have the highest tides in the world) right there beside them. We arrived there just in time for a tour with a docent, who took us to the beach during low tide. My daughter loved beachcombing for seaglass, which people are allowed to take. Fossils and rocks are prohibited for taking. Our docent was knowledgeable about the area and was available for people's questions, even after the tour. The centre is just as impressive, as it houses the fossil of the oldest reptile in the world. It also takes children into account and has a cave-like movie area in which one needs to crawl to enter. Stay in the centre for lunch, as the food is tasty and fairly priced. The souvenirs are also high quality. A couple of things to note: 1) the tour is a separate price from the entrance fee and 2) be aware of when high tide occurs, which will be posted in the centre. No tours on the beach will take place after high tide, much to the disappointment of some guests who arrived too late. The Joggins fossil cliffs are outstanding. Definitely worthy of recognition as a world heritage site. I have visited the site several times over the last 10 years, most recently in November of 2008. My son is doing a project for the National Heritage Fair and has chosen Joggins as his topic. The staff at the fossil center (despite the center not being open) met with us and spent 2 hours answering my sons questions, taking us down to the cliffs on a very blowy and cold afternoon and generally being exceedingly kind and helpful. The center is beautiful and the cliffs are highly interesting. I can't wait to visit on a warmer day in 2009. Tidal effects: Fundy Bay with the highest tides in the world. The beach cannot be visited during high tides. Dubbed as another WHS: "Coal age Galapagos" because of the assistance they gace to Darwin, Lyall et al in developing their understanding of earth and life science.